8 frame sizes, the 2 smallest frame sizes, in 4 ways, are convertible frame pin ornaments! Great for hanging 1 1/2" x 2 1/2" and 2x3" photos, by the new instant print cameras by Polaroid & Instax Mini, as well as smartphone portable photo printer devices by HP Sprocket and Prynt, to decorate a Christmas tree, hang around the house during the holidays, hang on an ornament tree for Halloween or Easter, or even Valentine's day! You can also use the 2 smallest frames as door or drawer knob hangers, or embellish a gift with them. Just cut an extra piece of ribbon the hang them! And the easel strut legs are removable, interchangeable with metal brooch pin backs to wear as costume jewelry or a name badge, display a photo on your lapel. The strut leg is attached with hook & loop, such as sew on Velcro! 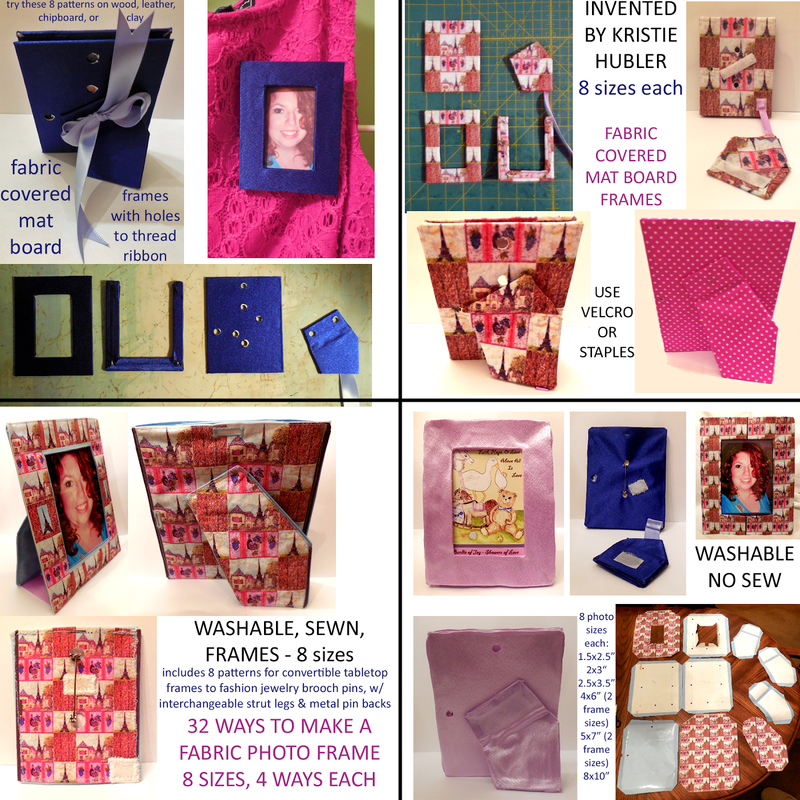 If you want to make a photo frame, using craft store supplies, AND it want it to stand on a table or hang on a wall, have it customizable, even washable (yes I make washable fabric photo frames, sewn & no sew), and can be made inexpensively, this download of patterns is for you! This download is a papercraft in that most of the panels / parts are printed onto paperback, iron on, fusible web interfacing by Therm o Web, Ultrahold or HeatnBond Lite / Featherlite, sold in Walmart $7.99 for 5 yard roll, Joann Fabrics at joann.com, Michaels $10.99 per 5 yard roll minus 50% off coupon, AC Moore $12.99 per 5 yard roll, and thermowebonline.com $11.94, as of 2017. You can cut and get 32 - 8 1/2" x 11" pieces from the 5 yard / 4.6 meter roll, then you run each sheet through your inkjet printer to print the patterns on the paper side of the Therm o Web interfacing. That will yield 32 small frame patterns, or up to 2 frames for an 8x10" photo. You'll need at least 5 five yard rolls to do all 32 of the frames, IF you choose to. Otherwise, make one frame at a time, by using the handy chart in the table of contents, that gives you EXACTLY how much of each supply that you will need, from fabric, to Ultrahold, to ribbon, to board, for each frame size and frame type, broken down into sections by type of frame, and size of photo. Then iron the glue side to the fabric or vinyl. The washable, no sew, fabric frame patterns can be printed onto paper card stock for paper photo frames, just reverse those pattern pages, or mirror them in your printer properties window. The download includes patterns for the fabric covered mat board or cardboard panels, as well as the removable mat board or cardboard, easel strut leg & easel back panels that slide out of their pockets on the back of the frame, for the washable, sewn & no sew frames. Kristie Hubler, artist, inventor & pattern designer of Fabricated Frames washable, sewn or no sew, paper card stock, vinyl, & fabric covered mat board / cardboard picture frames, 8 sizes, 4 ways, plus custom, copyright protected. All Rights Reserved. Not for resale. For personal use only. If interested in selling these frames in your store, for resale, or product licensing, please contact Kristie at fabricatedframescom@gmail.com for licensing & royalty rates, wholesale, retail opportunities. Thank you! Watch my videos on youtube at http://youtube.com/user/fabricatedframesCom for a video tutorial, step by step guide in how I make my frames!